This isn’t the place to attack or defend my Presidential candidate of choice. That said, to let last night’s comments from actor / director Clint Eastwood go without comment would be, well, an opportunity missed to discuss some deep and painful things. Mr. Eastwood addressed the Republican National Convention right at the top of the prime-time hour set aside for Republican Party Presidential candidate Mitt Romney. I’m not sure what the thinking was, but from what I’ve read today on the web, twitter, and print about Eastwood’s one-man ramble / skit / monologue, it appears Americans were left collectively scratching our heads. I’ll let the Academy judge the acting and script. I was more interested in what message 82-year-old Mr. Eastwood’s monologue sent. 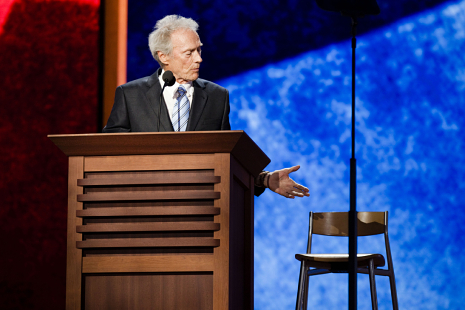 And my reaction — a negative one — centered on the empty chair at which Mr. Eastwood’s comments were directed. We were supposed to imagine President Obama in that chair, being addressed by Clint Eastwood in an interrogative manner. This Invisible Obama (hereafter referred to as “I. O.”) was not directly heard from, but we gathered from Mr. Eastwood’s give and take with I. O. that the Transparent President was dropping the “F” bomb (among other expletives). I. O. was definitely not very articulate, and had no good answers for what he was being asked by his interrogator. On the other hand, the only one who could hear what I. O. was saying was Mr. Eastwood. And that brings me to my own little story. which HE then answered for me. I was at first amused, then bewildered, as his questions became more and more pointed, his voice more shrill, and the answers of the I. T. (Invisible Trott) more ridiculous. It was a shocking experience for me; I was there, but I was not part of the conversation. My views and understanding were — in a plurality of senses — invisible. I was being caricatured in my own presence, but without humor or apparent consciousness on the part of the one doing that caricature. This went on basically for 30 minutes to 45 minutes — maybe even more. And through the experience I entered into a level of near-despair about language, words, and meaning. I did indeed feel invisible, diminished by another person to a level of invisibility. My own world of thoughts, feelings, hopes, fears, and the articulation I would have offered regarding those things had I been asked was, quite literally, unseen to him. Further, it seemed apparent to me that he did not want to see those things, therefore, he did not want to truly see me. So back to Mr. Eastwood and his Invisible Obama. As I watched Clint Eastwood’s eleven-plus minute presentation, I found myself feeling that familiar way, wronged even though it was not me being made the equivalent of an empty chair. I had been through that, I thought to myself. And the great thing about a discussion with an Invisible, Imaginary ideological opponent is this: You can always win the argument convincingly. I began these thoughts with a quote from my favorite novel, Ralph Ellison’s “Invisible Man.” In that novel, Ellison explores what it means to exist within a culture that systematically finds ways to make the visible into the unseen. The racial context is unavoidable and primary, as it has always been in American history and may remain for decades to come. But all of us have the capacity to render one another invisible. It is done by talking, literally or figuratively, to an empty chair. It demeans the one to whom we do it. And in the end, it demeans us who do it. We ourselves become the caricature, the cartoon, the straw man, disappearing into the smallness of our own projected Imaginary Other. It is we who become invisible.